Jane Avril, by Henri de Toulouse-Lautrec , 1893. Jane Avril is a lithograph print created in 1893 by artist French artist Henri de Toulouse-Lautrec. A long time friend and also the subject of this print, Jane Avril, commissioned an advertisement for her cabaret show at Jardin de Paris. Jane Avril, a passionate dancer, was a favourite subject of Henri, as she can be seen in many other of his famous works, such as Divan Japonais and Jane Avril Dancing. These pieces were prominent during the Art Nouveau period, which can be defined by floral motifs and the common use of fluid, curving lines. Art Nouveau was an art movement that sought out to abolish the traditional means of art – hence the name, which directly translates into New Art. This era was influenced by Japonisme, the movement where western art were heavily influenced by Japanese and eastern culture. which the idea of litho block printing was derived from. Art Nouveau can be characterized by its strong and fluid linear qualities,as well as simple blocks of bold colour with little or no colour. 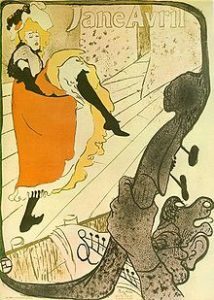 When I see this print by Henri, I can almost hear Jane Avril dancing in the music hall to the cheery and upbeat music. Because of the composition and the way the bass player is merely a silhouette, it allows me to feel like I am a part of the very scene itself; looking on to Jane Avril doing the can-can from the audience. The mood and atmosphere that the image provides brings on a certain nostalgia to an era that I have never experienced. The colors During the late 1800s, the music was very happy and upbeat – popular genres would include jazz and ragtime. This image reminds me of older cartoons where characters would almost comically dance to the sharp, bold notes and underlying piano. I can hear the rapid footprints of her dancing the can can, the cymbals clashing in the background along with upbeat trumpets. The whole thing sounds like a grand celebration! I attached what I think it would sound like below. Who’s Missing From our Textbook? Muriel Cooper.